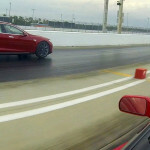 We had some time to test out the brand new Tesla Model S Performance at the StreetCarDrags.com event this weekend at Palm Beach International Raceway. 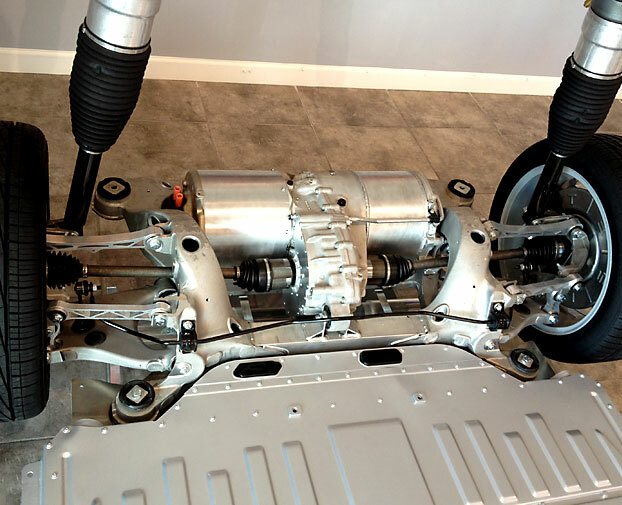 The Tesla Model S Performance is a zero emissions all electric car with an AC induction motor pushing out 416HP and 443 ft-lbs of torque from 0-5,100 RPM. 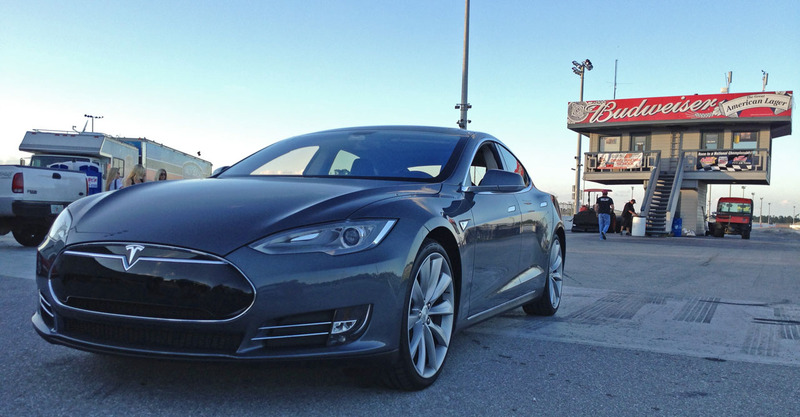 The Tesla Model S Performance ended up running a best time of 12.371 @ 110.84 MPH with 0-60 MPH coming up in just 3.9 seconds. 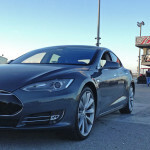 The National Electric Drag Racing Association (NEDRA) was on site running their Winter EV Nationals and verified the Tesla runs to have set a new world record for the quickest production electric vehicle in the 1/4 mile. 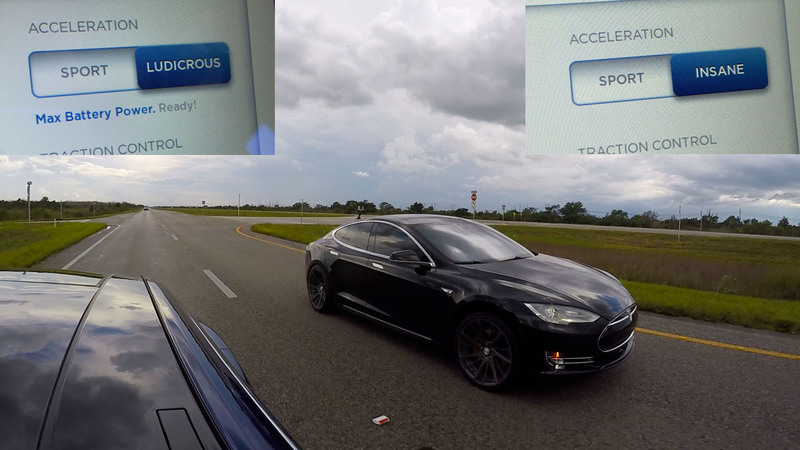 We started out with a full charge on the Tesla which indicated a range of 314 miles, after a 78 mile trip to Palm Beach International Raceway at 70 MPH the Tesla showed a range of 205 miles left. 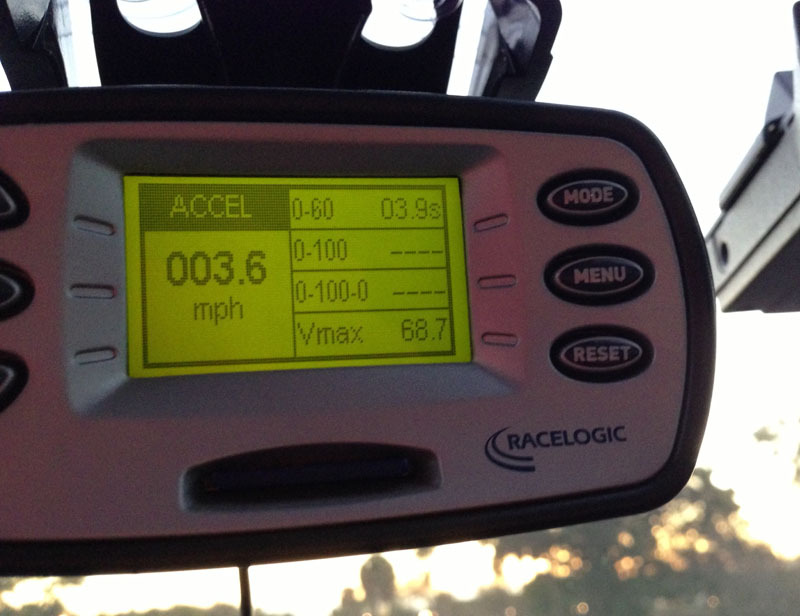 We made a few passes in the car shortly after arriving and the car was amazingly consistent running two back to back 12.678 passes @ 108 MPH. We then drove the car over to the RV parking area at the track and plugged into their 240v 40AMP charging station. After 3 hours the car was fully charged and we made another pass running 12.371 @ 110.84 MPH which was backed up by a few 12.4x passes. We’re not sure if the increase in performance is due a full battery or having the car cooled down, comments from electron buffs on this? Our test car was equipped with the 21″ wheel and tire package which weigh more than the standard 19″ wheels. We’re going to try and get our hands on some of the 19″ wheels to do some more testing to see what kind of performance gain they might have. 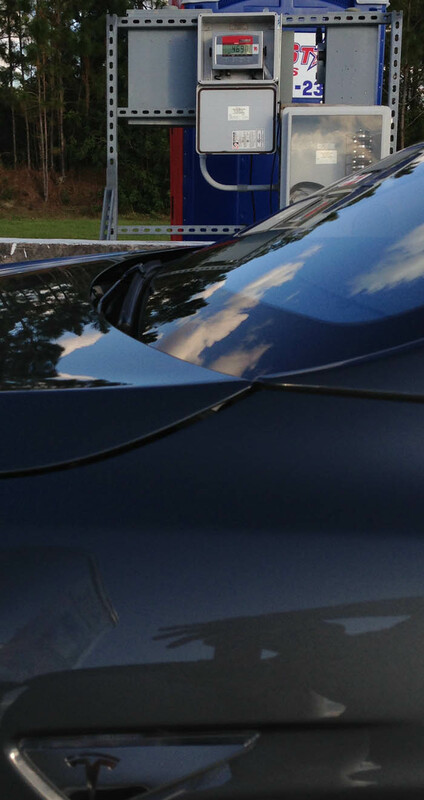 We also put the Model S on the scales where it weighed in at 4,690 pounds. It’s very impressive how a single motor the size of an office trash can propel this 4,690 pound car (4,870 with driver) to 60 MPH in under 4 seconds and runs low 12’s in the 1/4 mile in a rear wheel drive configuration. Imagine if Tesla put another one of those motors in the front. An all wheel drive, 832 horsepower electric sedan? Build it and we’ll be first in line! 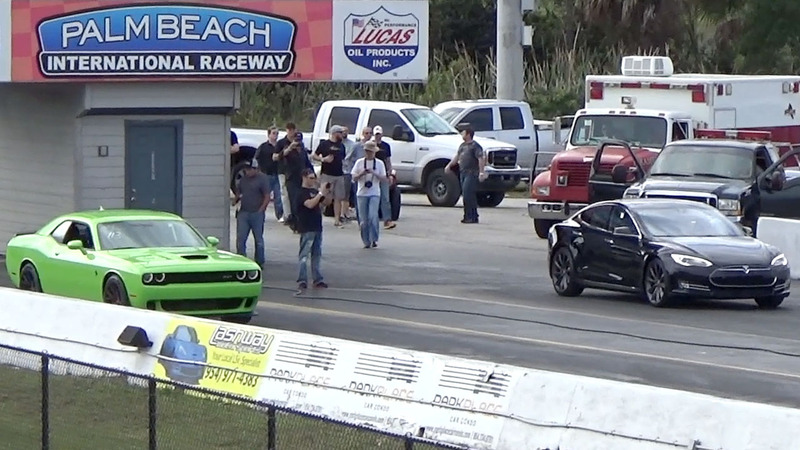 We have a lot of video to go through, but here is a teaser of the Tesla Model S racing heads up against a 2005 Dodge Viper SRT10 with exhaust and air filters. Tesla Model S owner here. It’s not surprising that you saw slightly better times with a full battery. Lithium ion batteries like the Model S’s have a (slight) decrease in instantaneous energy as the state-of-charge declines. The effect isn’t noticeable in ordinary driving. btw, the Model S is a superbly mannered street car, too! You were plugged into a 50amp circuit at PBIR. I was the toterhome next to you. Yes, thanks for sharing the circuit, we didn’t see you around when we first plugged in to ask…. For lunch? Yes, I’ll have the Viper Special with fries, please. Electrical circuits carry usually 80% of rated capacity, so the 14-50A RV circuit actually carries 40 amps. Both of you were correct. Hi, thanks for the great videos. I am a Tesla Roadster owner. Regarding your question as to the performance improvement with full charge vs. cooled off car: I believe the difference is the state of charge. The battery state of charge is the determining factor, not the car’s temperature. Regarding temperature, bearings and gearboxes generally have less friction after running for a while and being at operating temperature than when they start out cold. The power electronics efficiency changes little with temperature. On the other hand, regarding battery charge, the performance difference is the battery state-of-charge. Li-ion batteries have a voltage range of 3.5 volts uncharged to 4.2 volts fully charged. Banks of ninety-nine of these batteries are in series in my roadster – thus fully charged the battery is over 400 volts but with only partial charge the battery is less than 400 volts. That is a big difference in electromotive force. Thus, simplistically speaking, a fully charged battery can ideally offer about 20% more electromagnetic force than a depleted battery. 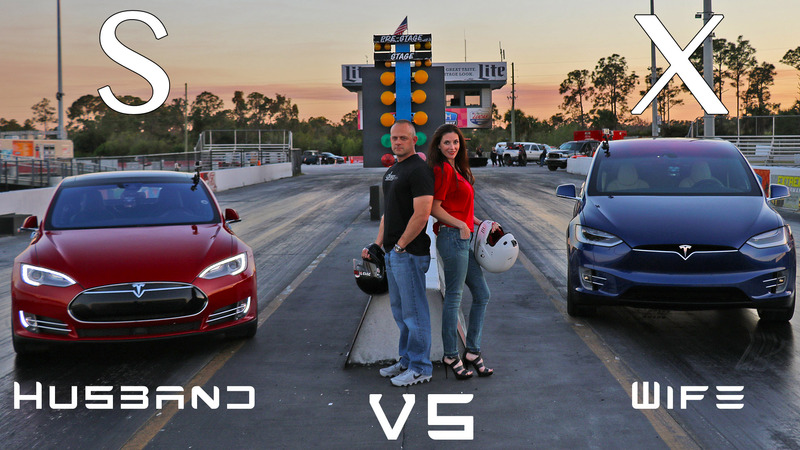 In the interest of battery care and longevity Tesla Motors never allows the battery to get near to either of these extremes – but the state-of-charge is an indication of voltage level and thus a fully charged battery will deliver more electric force to power the electric motor. 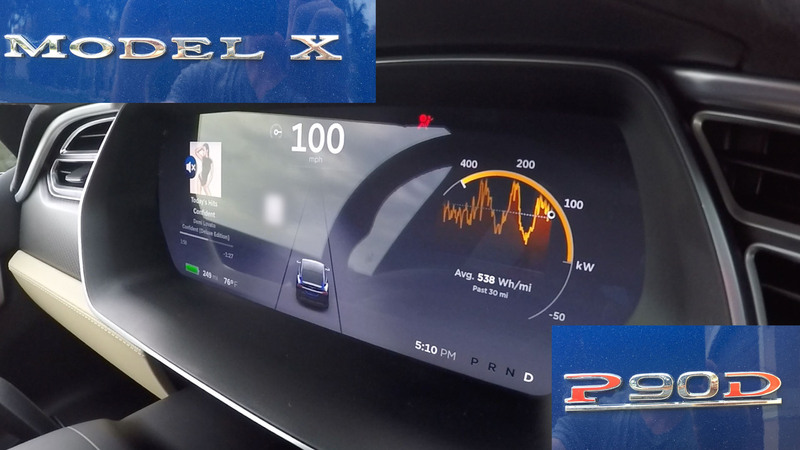 Day to day driving you won’t notice any performance difference due to state of charge – but if you drive it enough (maybe even just once) you might get addicted to the electric car’s impressive instantaneous acceleration and not want to get back into the gas burner.